Ring, maker of the popular video doorbells and recently launched Floodlight Cam, is today announcing a new line of Spotlight Cams. 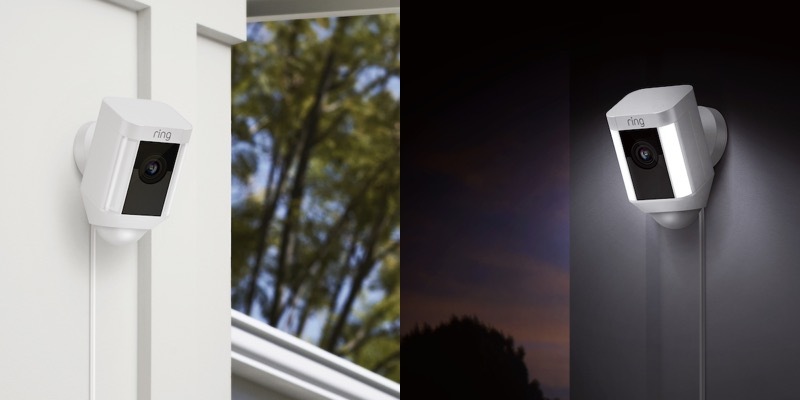 Similar in function to the Floodlight Cam but with a different lighting system, the new Spotlight Cam features LED light panels that automatically turn on when motion is detected, as well as a 1080p camera with night vision, two-way audio, and a 110 dB siren to let homeowners see activity around their homes and communicate with people who set foot on their property. The Ring Spotlight Cam will integrate with other Ring products through the Ring app to provide a complete security solution around the perimeter of the home. 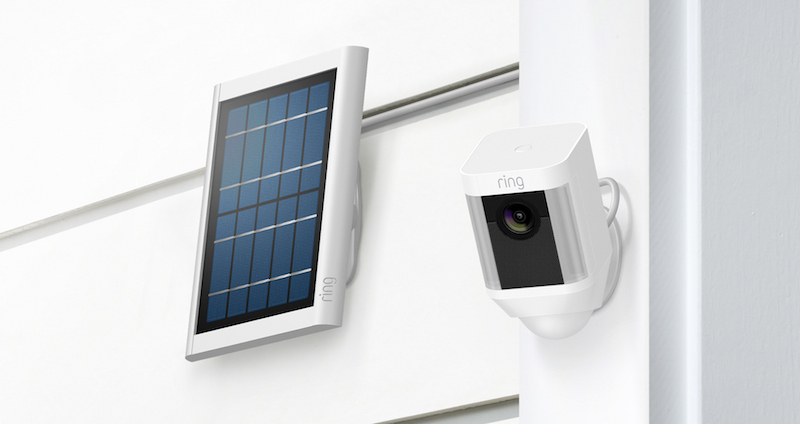 Ring's new Spotlight Cam is available in either black or white and will be available in three versions: Wired, Battery, and Solar. The Wired version includes a 270-degree horizontal motion detection angle, 140-degree camera field of view, and a 20-foot power cable. It is priced at $199 and is available to order today with shipments starting in 7–10 days. The Battery ($199) and Solar ($229) versions have a narrower 160-degree motion detection angle but the same 140-degree camera field of view as the wired version. The Battery and Solar models each come with a single 6000 mAh battery pack, but the light itself can hold two battery packs for maximum battery life. Extra battery packs are priced at $29 each. The Solar model comes with a Ring Solar Panel to keep the battery packs charged at all times. The Battery and Solar models are available for pre-order today and will begin shipping in the fall. I'm curious, for a security device that is always on. What would you use HomeKit interaction for? I have a ring doorbell and I don't miss HomeKit because I can't figure out what the use case would be. I'm asking because I'm sure there are some that I just haven't been able to think of. Perhaps I'm thinking about this wrong, but I want an outdoor camera (to see my property) that I can view remotely on my phone without paying a subscription fee for the privilege. I'm not terribly interested in archival footage, but I guess if there was motion detection some internal memory could solve that issue. The camera would connect to my wifi network (on the other side of the wall) and thus, to the internet, allowing me to connect from afar. I was seriously considering a Floodlight Cam not long ago, so this certainly is an interesting surprise. The solar option would be perfect... that said, I see it doesn't support HomeKit. Are there any security cameras that do that anyone can recommend? The ring doorbell pro, and the floodlight Cam will support homekit in the future. I have confirmed with their support/Founder that they have the chip installed (not that it matters anymore). The door bell is better off not being in HomeKit. I bought mine a year ago and love it. When someone pushes the button I get a notification on my Watch and my phone, it opens the app and you start seeing who is there. I'm not sure what good HomeKit would do, seeing as it's not specifically for monitoring your property. My security cameras aren't HomeKit either but I wish they were. Can you explain why door bell is better off without HomeKit? HomeKit devices will integrate with Siri and Home app and they will continue to work even if vendor goes out of business. It's very handy to pull out Home app from the Control Center and see the camera footage without opening the app. You would probably still use the app for more advanced functionalities, but HomeKit is VERY USEFUL to me. Furthermore, I can set an automation rule to tie multiple HomeKit devices together (e.g., when I am not home and it's 1 hour past sunset and someone rings the door bell, turn on the living room light). And I suspect in time, Siri will only become more powerful and useful (e.g., identifying who is at the door using facial recognition). Then out of my book. After October and into march or so can expect that around once a week or more. To me, the main benefit would be integration with Home app, which is much more accessible in iOS than Ring app. And I have lots of home automation devices, so the app would only get lost in the sea of apps. Beyond that, I like automation integration (when someone is at the door, and it’s past sunset, turn on the living room light) and Siri (is somebody at the door?, show me outside the door).